For artist Elaine Parks, the annual invasion of Mormon crickets in the Nevada town of Tuscarora is an event she anticipates with both deference and dread. Located about 50 miles north of Elko in the northeastern region of Nevada, Tuscarora is just one of many small towns across the American West that braces for the insects—known formally as shieldbacked katydids—that invade each year. 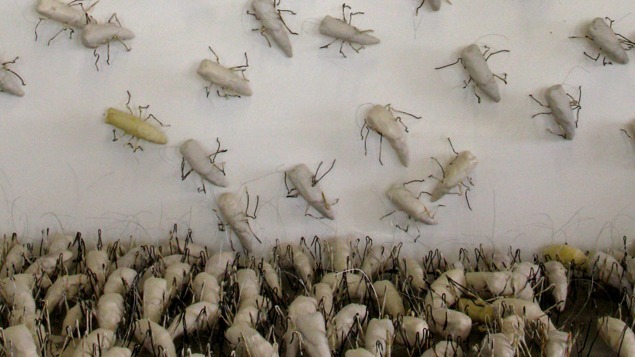 Parks’ installation Swarm consists of over 2,000 larger-than-life-sized clay crickets that cover the entire floor and ascend the walls of the gallery. A former associate of the Tuscarora Pottery School, Parks moved to Tuscarora in 2000 after receiving her MFA from California State University, Los Angeles in 1999. Parks now lives in Tuscarora and Los Angeles.